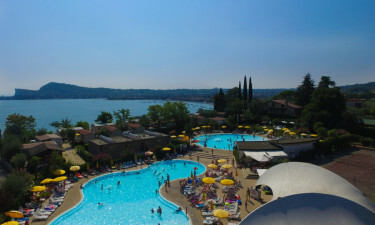 Situated directly on the western shore of Lake Garda in Italy, Europa Silvella offers campers and holiday-makers much more than just standard camping facilties. With the beautiful views of Lake Garda and the surrounding Valtenesi hills, this luxury camping site promises a peaceful and relaxing but fun-packed vacation. With a superb choice of accommodation, each mobile home and holiday home comes fully-equipped with air-conditioning and a separate kitchenette. Book a camping holiday today with LUX-camp and take advantage of some outstanding deals and prices. Please note that at check-in at the campsite reception a copy of all passports must be presented for registration. Unfortunately there is no photocopier available on site. Why stay at Europa Silvella? Europa Silvella has many activities available that the entire family can enjoy. With daytime and evening entertainment, there is very little time to get bored and the evening animation program is both delightful and amusing. There is a tennis court, a volleyball court, a small golf course and a 5-a-side football pitch for those who enjoy their sports and there are regular tournaments and competitions for both children and adults to take part in. With many cycling routes to explore and nature trails to follow, a fun day enjoying the great outdoors is easily achievable. Bikes can be conveniently hired from bike hire facilities within the campsite. No holiday is ever complete without a spot of relaxing on a gloriously sunny beach. 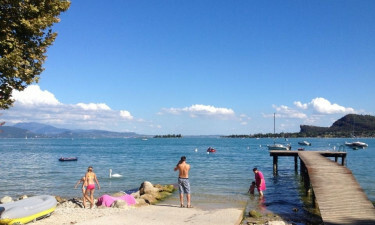 At Europa Silvella, campers have direct access to the wonderful Lake Garda and there is both a sandy lakeside beach and a pebble beach for holiday-makers to enjoy. With numerous water-sporting opportunities available, the young campers can have fun surfing, sailing or diving whilst the adults soak up the sun and relax. Fishing is also an enjoyable pastime whilst staying at this fabulous holiday camping site and there is a boat hire facility located right on the beach. With so much to do and superb weather to enjoy, it is easy to see why visitors to Europa Silvella return year after year. For relaxing days in the sun, grab one of the sun-beds that surround the two outdoor pools and watch the children splash around. There is a water slide and a shallow pool for babies and toddlers to play safely. Whether you want to get stuck in a good book whilst the children play or join in with the wide range of activities that are available around the pool throughout the day, having two outdoor pools gives this luxury camping complex the edge when it comes to other camping sites. The on-site restaurant has an extensive selection of fabulous dishes and is great for an evening out. The pizzeria that is located within the grounds offers a take-away service for the occasional night in. 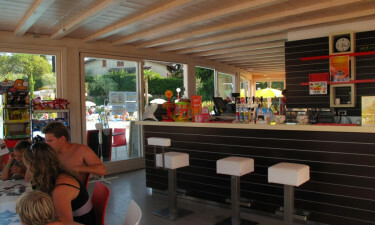 There are also snack food outlets open during the day and there is a pool-side bar serving drinks and ice-cream. There are plenty of opportunities to buy groceries within the grounds and there is a small supermarket located close to the beach.